Software-defined networking is a new approach to networking that brings programmability to network devices which is hitherto unseen in this field. It also enables centralized managing of network devices. It enables programming devices in plethora of languages like Java,Python,Ruby,C,C++. It also promotes open software in networking devices rather than closed source systems which exist today. Current network scenario is marred by many problems like complexity which is caused by plethora of protocols developed by organizations which are static in nature in contrast to dynamic nature of traffic. Current networks cannot be managed through centralized systems.They are unscalable in nature which make them unsuitable to ever increasing requirements of networks. Also today’s networking industry is a oligarchy consisting of few companies. 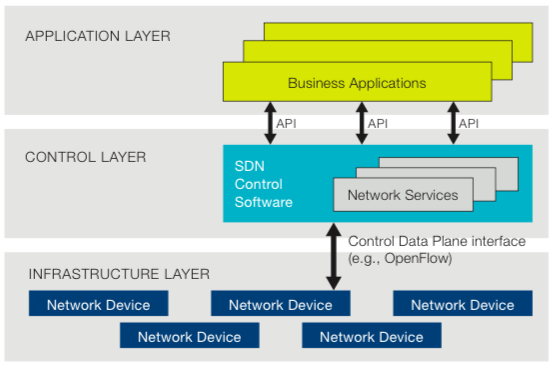 SDN is characterized centralized control of multi vendor devices. All SDN enabled network devices can be controlled by a centralized system irrespective of the vendor. OpenFlow-based SDN offers a flexible network automation and management framework, which makes it possible to develop tools that automate many management tasks that are done manually today. OpenFlow‘s flow-based control model allows IT to apply policies at a very granular level, including the session, user, device, and application levels. Main feature of SDN is that it brings awesomeness of open source to networking & thus automatically bringing down the cost of networking devices.